Music is an important part of our worship and congregational life. Our pianist provides a valuable ministry every Sunday during the services. The adult and children’s choirs prepare a wide variety of special music for the services. 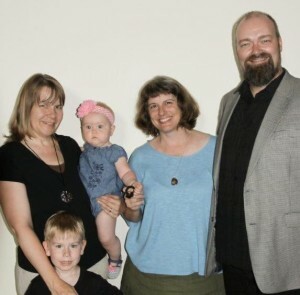 We also have several other musical groups, including an old time string band and a gospel/rock band, and talented members and children perform during worship services. We have an all-volunteer choir, and everyone is welcome! We sing music from many centuries and cultures, in many languages and styles. The choir not only enriches our spiritual experience with music on Sunday morning but also does important social outreach to the larger community. We have performed at prisons, community events, and memorial services, including September 11 memorials, Holocaust memorial services, the AIDS Quilt Display, Habitat for Humanity builds, and even the Mayor’s Inaugural. The choir also frequently collaborates with other community music organizations, including the Bloomington Symphony and the Bloomington Community Band. The choir rehearses on Thursday evenings, 7:00-8:30 p.m. mid-August through May, and childcare is available by request. Click here to request childcare. Our Music Director Susan Swaney can be reached here. Click here for Adult Choir Resources. 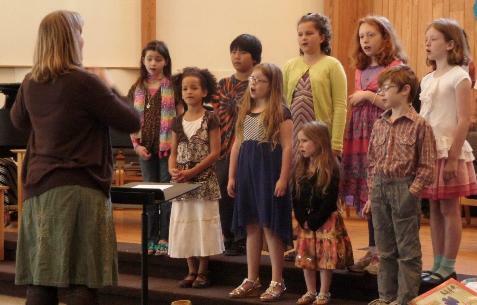 Nurturing a love of music in our youth is a very special part of our congregational life. The children’s choir is one avenue for young people to find their voices, express themselves, and share the gift of music. Our children’s choir director, Jill Courtney, is committed to enriching the lives of children through music and movement. With just the right amount of patience, compassion, and enthusiasm, she connects with children as the individuals they are while guiding them to sing as one, very special voice. Children’s Choir Directory Jill Courtney can be reached here. Susan Swaney has been our Music Director since 1992. 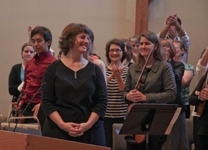 Since then, the choir has grown to over 70 members, has performed major works such as Brahms’ Ein Deutsches Requiem and Malcolm Dalglish’s Hymnody of Earth, and has commissioned and performed new works by composers Lauren Bernofsky, Cary Boyce, Malcolm Dalglish, Mary Goetze, and many others. Swaney is also Artistic Director of Voces Novae chamber choir, which creates thought-provoking and multi-faceted thematic programs. Susan holds a Bachelor of Music degree in Music History and Violin from the University of Michigan, a Master of Music degree in Voice Performance and a doctorate in Choral Conducting from Indiana University. Her singing credits include lead soprano roles in Candide, Ghosts of Versailles, Nixon in China, and Les Noces at IU, and tours with Aguava New Music Studio to Israel, Mexico, the New York Microtonal Festival, and the Library of Congress.